Picking the right nursing shoe is critical for healthcare, dental and veterinary professionals. Uniform Advantage’s newest infographic outlines what factors determine the best choices for their work environment. These brands all provide an array of shoes that are both stylish and provide the support our customers need. Uniform Advantage recently released their latest infographic titled "Happy Feet = Happy Healthcare Professionals." One quarter of a person’s bones are in their feet, and when they are out of alignment, so is the rest of their body, which is why healthcare professionals need to pick the best shoe for their work environment. A person’s feet are two of the most important parts of their body and can affect their overall health in many ways. A typical day for most medical professionals include long hours of walking, running and standing. This can be tough on their feet, joints and back. Many of them work 12 hour shifts, 3 times a week and stand on their feet for 11 of those 12 hours. Performance, Support, Comfort, Durability and Fit are elements of a good shoe that promotes good foot health. Healthcare professionals choose their footwear based on 3 factors: Functionality, Comfort and Style, of which the first two are the most important. Shoes must have good arch support with a solid sole. A poorly constructed sole with little arch support increases plantar fasciitis, a condition that causes feet to get swollen and inflamed limiting how much a person can stand or walk. In helping medical professionals figure out what the best nursing shoes are for them, their initial impression may be that they have to sacrifice fashion for functionality. However, just as medical scrubs have evolved, so have shoes for the healthcare, dental and veterinary professions. 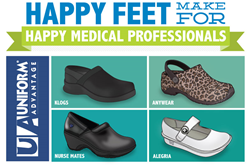 To ensure support is at the upmost best, many nursing shoe companies design their shoes to meet the requirements of the American Podiatric Medical Association (APMA), the leading professional organization representing the nation’s podiatrists. All shoes that meet their standards have their Seal of Acceptance. Lori Nadeau-Dunlap, VP of Marketing added, “At UA, we have found the most popular shoe brands worn by professionals in the healthcare industry are: Dansko, Cherokee, Alegria, Nurse Mates, Klogs, Anywear and Koi by Sanita. These brands all provide an array of shoes that are both stylish and provide the support our customers need.” For additional information about this infographic, please visit http://www.uniformadvantage.com/a-day-in-scrubs/hot-topics/right-nursing-shoes.asp. Uniform Advantage (UA) is a leading retailer of scrubs and medical uniforms. Founded in 1985, the company operates out of Plantation, Florida and ships from their distribution center near Atlanta, Georgia. UA has grown to include 30 retail stores located in key cities across the U.S., a catalog division and an entity dedicated to the online market.